Quality of a masseur depends on his equipment. 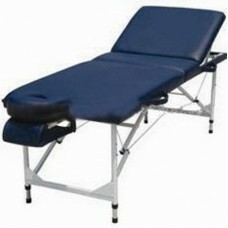 “SM- 8” massage table is an indispensable assistant for each expert in the field of massage. It can be used not only in specially equipped parlors, but it’s also perfect for a massage at home. It is important that its basis is made of durable and lightweight aluminum; because of this it can withstand a weight of about 204 kg. Massage table height is adjustable, a headrest and a jack for hands are regulated too, and a height has nine positions. This table “SM-8” is certified according to ISO 9001, it has the brand CE.